ASPERA-3 Main Unit with the ELS protective cover removed. The NPI particle entrance and the two NPD entry ports are protected by red covers. The mechanical scanner sweeps the three sensors mounted on it through 180 degrees to give the ASPERA-3 instrument 4π steradian (unit sphere) coverage when the spacecraft is 3-axis stabilised. The scanner is equipped with two stepper motors, which turn a worm screw. The screw drives a worm wheel, which is attached to the moving part of the scanner. The scanner payload can be turned to any arbitrary angle or perform continuous scanning. The operational rotation rates are 1.5, 3.0 and 6.0 degrees per second. The system offers an angular positioning accuracy of 0.2 degrees. The Digital Processing Unit's main task is to control the sensors and the mechanical scanner. 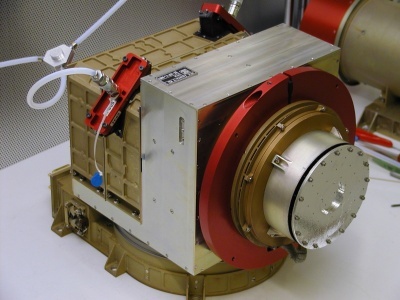 The DPU processes, compresses and stores the sensor data and forwards it (together with housekeeping data) to the spacecraft telemetry system. It also receives and implements commands sent to the ASPERA-3 instrument by the spacecraft telecommand system. The primary design drivers for the Digital Processing Unit (DPU) are optimum use of the allocated telemetry rate and correct handling of telecommands. The ASPERA-3 instrument makes extensive use of sophisticated lossless data compression to enhance the scientific data yield. The principal compression method used is based on the Rice algorithm, an adaptive compression technique that remains efficient over a wide range of input data entropy conditions. This is achieved by employing multiple encoders, each of which is optimised to compress data in a particular entropy range. The structure of the algorithm also permits a simple interface to data packetisation schemes, such as those used for space data communications, without the need to carry auxiliary information across packet boundaries. In the Neutral Particle Imager, incoming particles pass between two 150 mm diameter discs, which are separated by 3 mm and have a 5 kV potential between them. Charged particles are deflected by the electric field and captured, but neutral particles pass between the discs. The space between the discs is divided into 32 sectors by plastic spokes, forming 32 azimuth collimators with an aperture of 9 degrees by 18 degrees each. Neutrals that pass through the deflector system hit a 32-sided conical target at a grazing angle of incidence (20 degrees). The interaction between the neutral particles and the target results in production of secondary electrons and ions, and / or reflection of the primary neutrals. The particles leaving the target are detected by a Micro Channel Plate (MCP) stack with 32 anodes. The signal from the MCP gives the direction of the primary incoming neutral particle. The MCP is operated in such a way as to detect sputtered ions of the target material, ions resulting from stripping of the primary neutrals and neutrals reflected from the target surface. In order to improve the angular resolution and collimate the particles leaving the interaction surface, 32 separating walls are attached to the target, forming a star-like structure. This configuration allows the particles to experience multiple reflections and reach the MCP. The target is specially coated to prevent incoming ultraviolet photons that strike it from producing erroneous results. The Neutral Particle Imager covers 4π steradians in one 180-degree sweep by the mechanical scanner and produces an image of the ENA distribution in the form of an azimuth × elevation matrix. The direction vector of 32 elements is read out once every 62.5 ms. 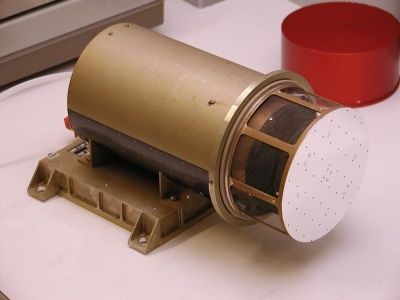 The Neutral Particle Detector consists of two identical pinhole cameras each with a 90-degree Field of View (FoV) in the instrument azimuth plane and arranged to cover a FoV of 180 degrees. Particles approaching the pinholes pass between a pair of quadrant deflector plates separated by 4.5 mm and with and 8 kV potential between them. Charged particles with energies up to 70 keV are deflected, while neutrals proceed into the camera. The deflector plates also function as a collimator in the instrument elevation direction. The collimated Energetic Neutral Atom (ENA) beam emerging from the 4.5 × 4.5 mm pinhole hits a target at a grazing angle (20 degrees) and causes secondary electron emission. The secondary electrons are detected by one of two Micro Channel Plate (MCP) electron multiplier assemblies. The MCP output provides a start signal to the electronics that measures the time of flight of the ENAs over a fixed distance. The incoming ENAs are reflected from the target nearly specularly and travel to a second target. Again, secondary electrons are produced and detected by three more MCPs, which pass a stop signal to the time of flight electronics. The time of flight between the two targets gives the velocity of the incoming particle. Which of the three 'stop' MCPs detects the incoming particle determines its (instrument relative) azimuth direction. Since secondary electron yield depends on both incident particle mass and velocity, the mass can be determined, given that the velocity is known, by analysing the height distribution of the pulses from the MCPs. The effects of ultraviolet radiation are suppressed by coating the targets appropriately and checking for coincidence between the start and stop signals used for the time of flight calculations. As the mechanical scanner moves the NPD through 180 degrees, a 2π steradian (half sphere) coverage of the incident particle field is obtained. The Electron Spectrometer determines the energy spectrum of incoming electrons in each of sixteen 22.5-degree sectors. The Electron Spectrometer is based around a spherical section electrostatic analyser of 'top hat' design. The electrostatic analyser consists of two concentric hemispherical electrodes, the outer of which has a central hole, through which electrons are admitted, covered by the 'top hat' and collimator. Electrons arriving from any azimuth angle and within the elevation field of view of the collimator pass under the 'top hat' and are deflected through the central hole in the outer hemisphere by a positive potential on the inner hemisphere. The electrostatic field between the hemispheres will deflect electrons having an energy in a particular range such that they travel between the electrodes. Electrons with energies outside the selected range will be captured. These energy band filtered electrons exit the annular gap between the hemispheres and hit a Micro Channel Plate (MCP) electron multiplier. Beyond the MCP, the electrons strike one of sixteen anodes, each defining a 22.5 degree sector of incident azimuth angle. By varying the electrostatic potential between the hemispheres of the electrostatic analyser, the energy of the electrons selected by the filter can be changed. The voltage applied to the inner hemisphere is swept once every four seconds and the number of anode hits per sample interval is recorded to give an energy spectrum for the incoming electrons in each sector. As the ELS sensor is moved through 180 degrees by the mechanical scanner, a complete 4π steradian (whole sphere) angular distribution of electrons is measured. The Ion Mass Analyser determines the mass spectrum of incoming ions in a selectable energy range. The mass range and resolution of the spectrum are also selectable. ASPERA-3 Ion Mass Analyser with red protective cover removed to expose the particle entrance. Ions arriving at the IMA pass through an outer, grounded grid and enter the deflection system. The deflection system comprises two curved, charged plates that deflect ions arriving in the instrument elevation range from 45 degrees above to 45 degrees below instrument azimuth plane and from any azimuth angle into the entrance of the electrostatic analyser. The electrostatic analyser consists of two concentric hemispheres with a variable electric field between them. Ions that lie within the energy pass band of the analyser travel between the hemispheres, exit the annular space separating them, and travel on towards the magnetic mass analyser. The electrostatic potential between the hemispheres determines the energy range of the ions that pass through the analyser. In the magnetic mass analyser, the ions pass through a static, cylindrical magnetic field, which deflects light ions towards the centre of the cylinder more than heavy ones. An electrostatic potential can be applied between the electrostatic analyser and the magnet assembly to accelerate the ions. Varying this potential allows selection of the mass range to be analysed and the mass resolution. As the ions leave the magnetic mass analyser they hit a Micro Channel Plate (MCP). The electrons exiting the MCP are detected by an imaging anode system. A system of 32 concentric rings measures the radial impact position, which corresponds to ion mass and 16 sector anodes measure azimuthal impact position, which corresponds to ion azimuth angle.